OK Lincoln Marathon and Half-Marathon competitors, it’s time to make yourselves known. I would love to cheer you on but I need to know who I’m looking for. Which of you are participating this year, and how might I recognize you? I know Fletch is running the half, with a goal time somewhere between 1 and 3 hours (I made that up). My mother is walking the half, trying to keep up with last year’s zippy 13:30 pace. As per my annual tradition I will cheer on the runners while eating a donut outside Lamar’s at 48th and Pioneers. Yeah, I’m an ornery son of a gun. In related news, I’m getting closer to deciding to run in next year’s half-marathon. It’s a year away so a lot can change, but it sure sounds like a fun challenge right now. My body isn’t exactly built for distance—I’ve always been a 400m - 800m guy—but I’ve had some fun on long runs lately. I even ran 15K on Sunday, my farthest run ever. I’m telling y’all this because maybe that will help me to actually follow through with it. As for this year’s race, good luck to all the competitors and remember to have fun. To the spectators, come out in droves. And to the drivers ... have patience, and for goodness sake please turn off your engine while you’re stuck for an hour. No sense wasting all that gas. I hear Hot Wok opened recently in Clocktower Shopping Center at 70th and A. I know nothing about it beyond the name, and my google-fu isn’t turning up anything. So I turn to you. Do any of you know anything about Hot Wok? Have you tried it? Heck, maybe I’ll give it a go for lunch today. Or tomorrow. Or Saturday. Actually, any of the next three days would work for me. I’ll be back with an overview-slash-review if I make it there. In the mean time ... who’s got the scoop for us? The Missus and I spent a couple hours last night enjoying good food and good company at Capital City Grill. We participated in a four-course, Titanic-themed meal and wine tasting thanks to an invitation from the Goulds of Pine Crest Farms Bed & Breakfast. (The Goulds own Capital City Grill’s building.) There were about 35 people present. We had never been to Capital City Grill before so our only expectations of the food were based on the restaurant’s online menu. Last night’s menu was based on the last meal served on the Titanic before ... well, you know. The four courses were Oysters Rockafeller; cream of barley soup; sliced sirloin steak with roasted potatoes and creamed sweet carrots; and Waldorf pudding. It was not a meal I normally would have found myself ordering, but that’s half the point of a meal like this. My favorite part was the sirloin, but all of the components were excellent. As for the wines, I’m not the guy to ask about their quality or the appropriateness of their pairings. I don’t drink alcohol and my knowledge of wine ends at “fish: white; steak: red”. Nevertheless, I drank everything served to me last night. Unfortunately—or rather fortunately from my wallet’s perspective—I was not converted to oenophilia. The wine fans (read: pretty much everyone else) all seemed to dig the offerings. Apparently Capital City Grill features these special themed meals and wine tastings every now and again. I would love to go back, even though I can’t quite appreciate the wine component of the evening. Still, I enjoy trying new things, and I love being among adult conversation that doesn’t automatically center around our kids’ most recent antics. In addition I want to get back to Capital City Grill to try out their regular menu. That’ll have to happen on a kid-free evening so it probably won’t occur any time soon, but it’s on our list. I hear they are putting a lot of effort into evolving their lunch menu so that’s an option as well. Have any of you tried Capital City Grill yet, either for their regular menu or for one of these special events? I can’t figure out where her $720 million figure comes from. After reading her “Issues” page, I’m not even sure she knows where it comes from. For example she seems to use the words debt and deficit interchangeably. If she makes that fundamental mistake, and if she doesn’t provide any accounting of the $720 million, how am I supposed to trust that the number is legit? I expect more—significantly more—from somebody who wants to be mayor. Lincoln has plenty of issues to deal with, many of them financial. Ms. Buffington, tell us something we don’t know. Like how you prioritize those problems, or specifically what you intend to do about them. And for goodness sake if you’re going to throw around a big number like $720 million at least have the common decency to tell us where it came from. Otherwise it is little more than a bogeyman intended to rile up the most gullible voters. Can any of you, dear Lincolnites, determine where Ms. Buffington’s $720 million comes from? I posted this on Twitter already but I’ll repeat it here for those who didn’t see it. It seems a Teavana store is going into Gateway on the corner near Dippin’ Dots and Things Remembered. I didn’t see an opening date, but typically stores at Gateway don’t announce their openings all that far in advance. I would think it’ll be open within a few weeks or maybe a couple months. Tea is one of those things I’ve never been able to get into, but at the same time I’ve never been presented with an opportunity to explore my options. Perhaps Teavana will offer samples. The Gateway location appears to be Teavana’s second Nebraska location; the other location is at Westroads in Omaha. I’m not crazy about Lincoln’s emphasis lately on making arterials as wide as possible. Driving on Pioneers Blvd. around Lucille Dr., for example, I feel like I stumbled across a runway for B-52s. With two lanes each direction, right turn lanes, and a wiiiide center turn lane, there’s space galore. We’re told that’s great for safety, but it’s killer on our wallets and ugly as sin, not to mention the fact that it invites drivers to speed like they’re on the Utah salt flats. Which brings me to the concerns being raised about updates to Old Cheney Road east of Highway 2. Disclaimer: Don’t take road-building advice from some guy who blogs from his basement. There’s a literal case of NIMBY going on here so we have to ask ourselves if this is really something Lincolnites as a whole should be concerned with. It is. Roads aren’t just about transportation. Roads also help define neighborhoods. 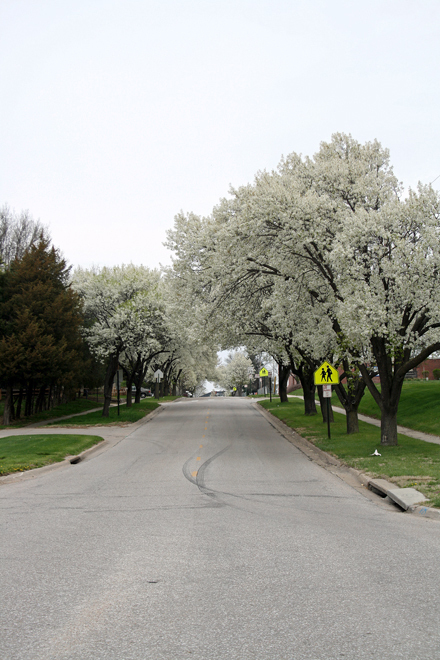 For example, compare and contrast Sheridan Boulevard and North Cotner Boulevard. Those two streets communicate very different messages about the neighborhoods they pass through. And need I remind you what the single lane portion of South 27th Street communicates about those neighborhoods? More broadly, those streets communicate oodles about how we, as a community, value the interaction between transportation, home, and business. One of the concerns expressed by Old Cheney neighbors involves the inclusion of right turn lanes into neighborhoods. The neighbors don’t want ‘em because it means that much more land has to be taken from their back yards. Road engineers argue that right turn lanes are safer and better promote the flow of traffic. Ditto for medians, which are also optional. So what’s our priority? Faster speed limits or streets that don’t look like they need an air traffic control tower? Having traveled the portions of Old Cheney Road that don’t feature right turn lanes for most of my life, I’m inclined to say we can feel confident in ditching that feature. The intersection at 35th and Old Cheney, among many others, doesn’t feel any less safe because of its lack of right turn lane. Perhaps accident data says otherwise. As for having a median, I personally prefer well-maintained medians over those bugly center turn lanes as they appear on Pioneers. When there aren’t many places to turn into, they use up acres of concrete despite the fact that much of the surface area isn’t particularly usable. Ick. I do have to call out Jon Camp on one error. He argues that Old Cheney’s design, as it is currently proposed, is excessive because “this is just a residential arterial”. Sorry Mr. Camp, but that’s just plain foolish. Sure that portion of Old Cheney isn’t much today, but to suggest that it isn’t a critical component of Lincoln’s long-term transportation plan is bizarrely short-sighted. That’s the sort of thinking that has led to some of the transportation problems we have in Lincoln today. Let’s not continue down that road (so to speak). Wouldn’t You Love to Teach Today? Any pre-algebra teachers out there want to teach a class for an hour or so today? I know, it’s a long shot. I’m off to study how to rationalize denominators ... er, something like that. You might think it’s bad news that UNL has announced $5 million worth of budget cuts. It will mean lost jobs and lost educational opportunities. That stinks. But there’s a plus side. No really. Some good comes out of every bit of bad budget news at UNL. See, every time UNL’s budget is mentioned, out come the folks who have no understanding of how the budgets of UNL’s academic and athletic sides relate to one another. And that’s fantastic, because instantly you can tell oodles about the worth of an individual’s blatherings. If a person understands that the Athletic Department budget is distinct from that of the rest of the University, he may be worth listening to. But if he thinks a cut in Food Science is Tom Osborne’s fault, you immediately know he’s a doofus. And since you know the doofus doesn’t let facts get in the way of his ranting, you can be pretty certain all of his opinions are fact-free. In other words, you can ignore his verbal dribbles on every topic! Yay! Sacrifice education for basketball at an arena…great decision, Lincolnites! You certainly have your priorities in order! Tom Osborne does not know everything, and everything that he says is not God’s word! He was wrong about the arena, and now our universities are suffering because of the lack of funds! That guy should retire and just call well enough alone before he makes more bad decisions for the rest of us. Of course, good ole John Camp (city council member, and owner of half of the Haymarket) was lobbying in favor of the arena, too. Looks like that guy is going to make a killing on the arena. What does he care about education, though, as long as his pocket book gets fatter by being in a position of power. GET JOHN CAMP OUT OF OFFICE!!! See how easy that is? By doing us the favor of conflating all sorts of unrelated things, “Bye bye education” has pasted a big ol’ “I R Dumb” sign on his forehead. Obviously that doesn’t do us a whole lot of good in an anonymous web venue, but plenty of folks say the same sorts of things when they’re fully identifiable. When they do, you quickly know just how much their opinions are worth. Seriously folks, please stop relating monies that have no relation. There are plenty of things to not like about the UNL Athletic Department, but stealing money from academics is not one of them. On the contrary, thanks to its support services the Athletic Department provides superior educational opportunities to a population that, on average, would otherwise be significantly worse off. If you want to talk about athletics taking funds from academics, check out the budgets of the other State colleges and universities. You’ll have a better chance finding what you’re after over there. 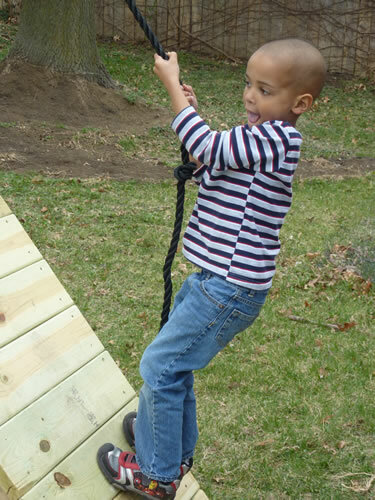 We recently finished constructing a new Playstar playset that we purchased from Menards. Read on to learn about the process and to find out how we like it. I’m having a really difficult time getting myself fired up over commercial vehicles legally parking in places that are advantageous for their advertising properties. You’ve seen them around: those trucks, vans, or other vehicles with prominent advertising on the side that are parked far from their apparent homes. But some folks are up in arms, and their natural reaction is “there oughtta be a law”. There appear to be three primary factors at play here. The first is unsightliness. Some folks don’t care for the mobile billboards’ aesthetic qualities. I’m not convinced that’s a reason to write up a new law. If you want to control your neighborhood’s visual vibe, go join a homeowner’s association. That’s not to say that the “look” of an area should never be subject to legal constraints, but a truck with a logo and a phone number surely falls short of any reasonable person’s concern. The second factor is convenience. In at least one instance, a business’s ability to receive deliveries is allegedly hampered by a legally-parked truck. It won’t take a creative person long to come up with oodles of solutions that don’t require a blanket, city-wide ban. A specific, targeted no parking zone (perhaps limited to common delivery hours) is certainly a better way to go, for example. The final factor appears to be simple petty rivalry. Some business owners don’t like how other business owners do things. It’s a tale as old as history, and frankly, it’s annoying. Rather than come to terms with an action that doesn’t actually hurt anyone (other than the easily-remedied situation noted above), a group of offended individuals runs to a lawmaker for assistance. It’s an uncreative and over-broad “solution” to a (mostly) non-problem. But you know me. I’m not the sort to look to an ordinance to solve life’s little annoyances until the justification is particularly strong. In this case, it isn’t. Perhaps one of you can convince me otherwise. Have a go at it. Who Are the Race Fans? You know how sometimes you’re going along and you see a business and you think “Who patronizes that place? I don’t know anybody who has ever been there!”? It happens to me pretty much every time I pass a Long John Silver’s, but that’s not the point of this post. I’m curious about the folks who support area race tracks, such as Eagle Raceway, Nebraska Raceway Park, and so on. Who are those people? I say that with no judgement whatsoever, so don’t mistake my purpose here. I’m genuinely curious. In my entire life I can only recall a couple times where an acquaintance has ever even mentioned going to an auto race in the area, and the most recent time was many years ago. Yet the raceways still exist and operate—the lights shone bright at Nebraska Raceway Park on Saturday night—so somebody is supporting them. Who? I hope the answer is one (or more) of you. I don’t like having these gaps in my connection to the area. It makes me feel incomplete. I figure I can’t participate in all the opportunities out there, but at least I can know people who do. So are you a race fan, or do you know somebody who is? What can you tell us about auto racing in southeast Nebraska?